The double-track system took off smoothly in various senior high schools (SHSs) throughout the country yesterday to ease congestion in public schools. However, parents and guardians in some schools raised concerns about the registration of first-year students under the system which is akin to the semester mode in tertiary institutions. Enrolment in the various SHSs in the country has skyrocketed largely due to the introduction of the Free SHS programme by the current Akufo-Addo administration. There was confusion in some schools because both Green Track students, who are starting school with immediate effect and Gold Track, who would go to school on November 8, have all thronged the campuses to register. This came to light when DAILY GUIDE visited some of the schools to assess the implementation of the programme and challenges associated with it. 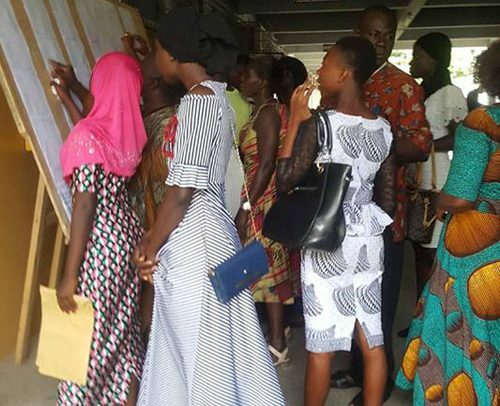 At Bompeh Senior High Technical School, Archbishop Porter’s Senior High, Ghana Secondary Technical School, Ahantaman Senior High and Methodist Senior High School, many parents were seen assisting their children to go through the registration process. Some parents at the Bompeh SHS complained that their children with Green Track were told they belonged to the second batch. Other parents also asserted that some teachers informed them that the Visual and General Arts students were to start classes yesterday. Later, Catherine Biney, Public Relations Officer (PRO) of the Metro Directorate of Education, said various headmasters had been tasked to take internal measures to ensure smooth running of the system. She explained that the double-track system would give opportunities to students from deprived communities to have access to quality or first-class education. Ms Biney added that under the double-track system, contact hours would be increased to allow students to have more holidays to enable them prepare well for examination. In the Ashanti Region, the new system commenced smoothly. Parents and their wards trooped to the various schools in the region in their numbers as early as 6am, the paper gathered. The authorities of the various schools attended to the parents without any delay. A parent, Agya Akwasi, said he was extremely impressed with the rapid manner in which he and the child were served by officials of Kumasi Academy SHS (KUMACA). According to him, the officials spent five minutes on every student, adding that the double-track system must be embraced by all Ghanaians. Another parent, Akosua Frema, commended the president for introducing the double-track system. Meanwhile, Mark Ofori, the Ashanti Regional PRO of GES, has confirmed that the double-track system has largely been successful on the first day of its introduction. According to him, the various schools had been able to admit first-year students successfully. In the Tema Metro area, some parents expressed concern about the unnecessary delays in the admission process. Later, the headmistress of the school, Elizabeth Asare, assured parents of speedy registration of their children. At the Chemu Senior High School (SHS), the students went through the process smoothly. The assistant head teacher of Chemu SHS was seen busily attending to parents and students. The situation was not different at the Ashaiman SHS and Tema Methodist Day School. Although most parents expressed satisfaction with the process, others also complained about the fact that their children were unable to get boarding status. In the Brong Ahafo Region, some students admitted as day students at the Sunyani Senior High School (SUSEC) altered their status to outwit authorities to go to the boarding house. Headmaster of Sunyani SHS, Michael Nsia Agyepong, revealed this to DAILY GUIDE when the paper went round yesterday to assess the situation. According to him, but for the vigilance of the authorities, two students would have outwitted them to gain boarding status. He declined to mention their names, but said they had been warned not to do so. Mr. Agyepong said the school started admitting the students in advance on September 6, 2018. By the time DAILY GUIDE reached the campus yesterday at 9:15am, about 500 students had already been admitted. The school authorities were expecting 1,620 students, with 1,108 being boarders and 512 day-students. He said due to the double-track system, the school has facilities to accommodate about 500 more students in the boarding house if given the permission. At the Twene Amanfo Secondary Technical High School, 395 students were registered by the authorities. In the Upper East Region, some parents and their children formed queues in many schools to go through the registration process. Some headmasters who were innovative started the registration on Monday, September 10. At the Bolgatanga Girls Senior High School, students with Green and Gold Tracks all reported on Tuesday, and this caused the delay in the registration of many Green Track Students. Some parents, whose children were to be admitted on the Green Track, wanted the school’s authorities to concentrate on them. The parents raised concern about the supposed GH¢210 covering two uniforms, simple cross sandals for classes, two white bed sheets and track suit. Later, Upper East Regional Director of Education, Augustine Ayire Zang, said he was not aware of monies being collected for items at the Bolgatanga Girls Senior High School. At the Zuarungu Senior High School, there was delay in uploading the students’ details onto the Free SHS Platform due to the availability of one laptop. Surprisingly, school’s authorities were not admitting students offering General Arts and Business which is contrary to happenings in other schools. For the 2018-2019 academic year, the school is expected to admit 1040 students, 520 for Green Track and 520 for the Gold Track. At Zamse Senior High School (SHS), students complained about courses offered to them, while others complained about their boarding status.